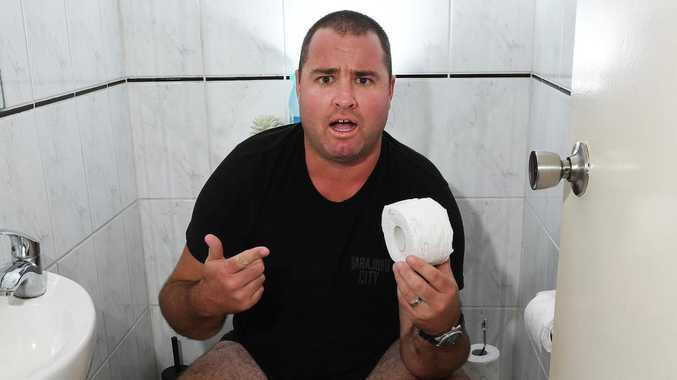 A DARWIN man has nearly been caught short after finding his toilet roll had been cut in half. Jono Holt said he came across the dodgy roll, cut straight down the middle, as he was replacing it and was lucky it wasn't during an emergency. "I just went to grab a new toilet role from the packet, and it had been cut in half," he said. "It was cut in half, so like half the size of a normal roll … it wouldn't have been much use at all, particularly if your using it for that sort of thing." Luckily for Mr Holt, it was right in the middle of the packet, rather than the dreaded last roll, meaning he could simply grab a fresh one. "It was the middle one so we had other toilet rolls to use - It was a bit like a Kinder surprise, just in the middle of the packet there"
"I thought what the … it's just pretty unusual to see a half roll in the middle of your block of 24 toilet rolls or whatever, maybe it was a prank at the (toilet roll) factory." While most would simply turf the useless roll, or find another use for it around the house, Jono has a much simpler approach. "Now it's gotten me into the NT News I might stick it up on the wall."